It's time to get the spandex and the capes ready: DC Universe Online is coming out in November. 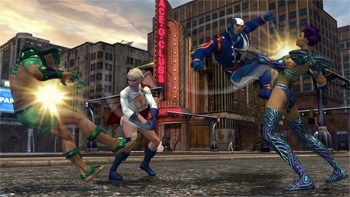 Up until now, Sony Online Entertainment has been providing regular updates about DC Universe Online, though the publisher has been rather tight-lipped about when the game was actually going to be released. This has changed, however, and the release is closer than many people expected: November, 2010. Sony announced the release date during an event where the game's E3 demo was on display, which featured a trip to Harley Quinn's lair to rescue Robin. IGN was on hand for the demo and the announcement, and came away with some great impressions, stating that the game seems even more robust and fun than it has in the past. I got to spend some time with DC Universe Online at E3 last year and came away surprisingly pleased with how the game was coming along. The combat was an especially nice surprise, since it was fast-paced and worked extremely well with the PS3's controller. A UI engineer for the game who chatted with me during my playtime told me that the development team was determined to make a great game from the beginning because, "Warner Bros. and DC Comics sat us down at the beginning and told us, in no uncertain terms, 'don't screw this up.'"